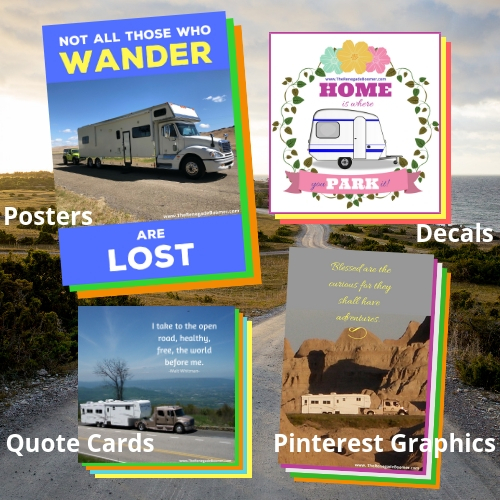 RV-Inspired Posters, Decals, Quote Cards, Pins -- all FREE? Yes, I Want Them All! The RV Lifestyle is an incredible way to live and work on the road. But chances are, you might need to figure out how to create an RV office space, as well as reliable Internet. If you want to be an RV entrepreneur or digital nomad, conquering these two issues should be right at the top of your to-do list. I realize this can be a bit tricky if you are in a very small RV, so tap into your creativity! You might need to have a temporary table you can set up, a way to use the dashboard area, or work on your dinette. 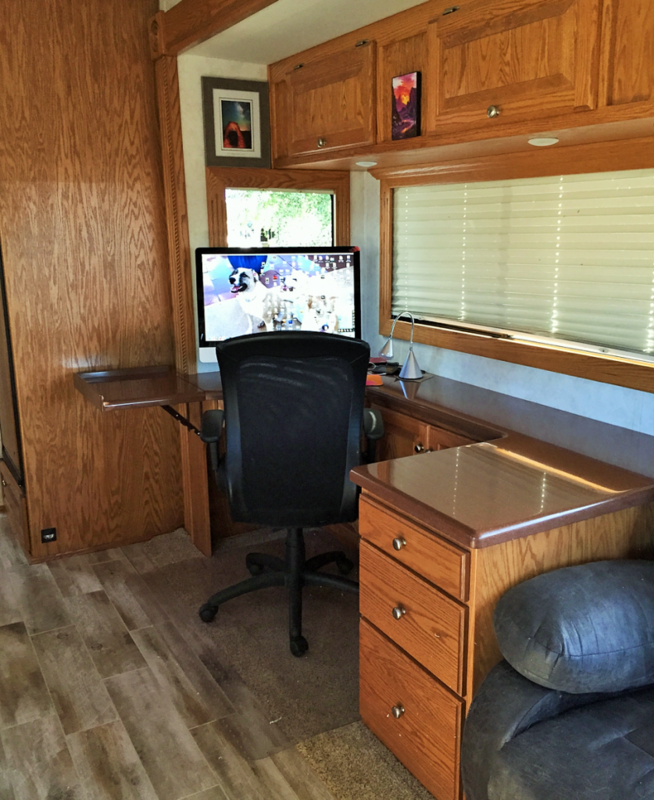 I absolutely require a dedicated work space, so we have always customized every RV we have owned or had built, to include an RV office for me. I also prefer to have an office chair to work in, rather than perch on a couch, or precariously balance a laptop. I keep more focused, and my back is happier too. 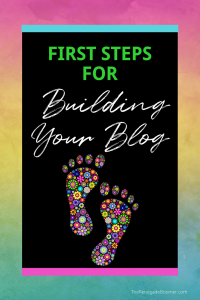 I realize there is an abundance of images and photos for working on the road that glorifies the concept of sitting at a picnic table, lounging on a beach, or some other idealized scenario for working from anywhere…but that’s not how I’ve done it! Usually, the choice we have made is to jettison the dinette, in favor of an office space. If we are going to be flexible about a seating arrangement, we will sacrifice the dining option rather than the office setup. We’ve made that more workable by having a custom-built theater type loveseat that has a small table in the center that can be raised or lowered, with cupholders in it. So, we can manage balancing plates and drinks that way! Before we switched to a motorhome for our RV life, we had several custom built fifth wheels…five to be exact! It was compact but did the job. It also had a pullout work surface above the drawers on the left side, which expanded the desktop for me when I was working. 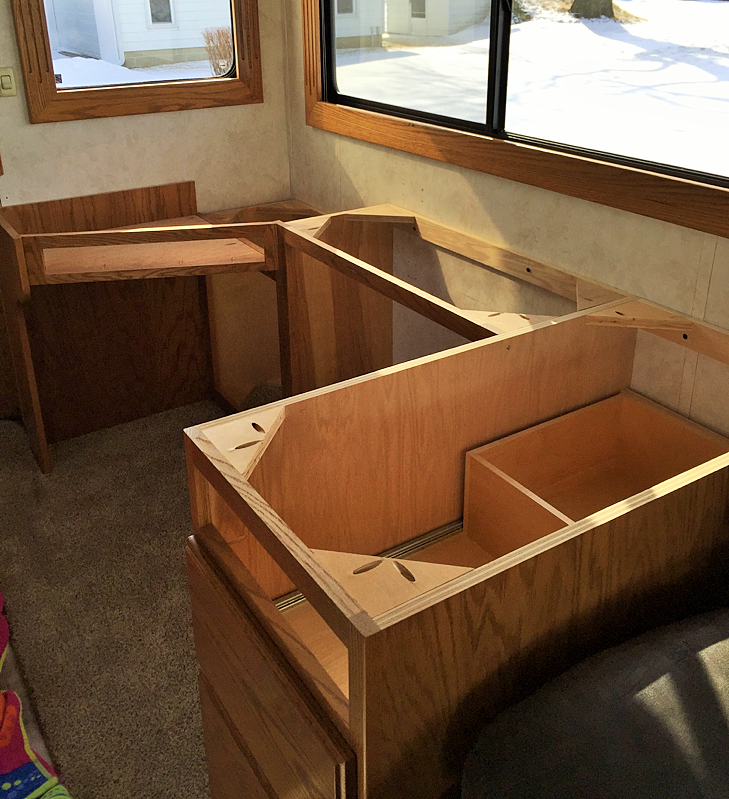 In other 5th wheels, we designed L-shaped work spaces in lieu of the dinette, which also worked very well. Now we have what is called a Super-C motorhome, which means a Class C motorhome on steroids with huge carrying capacity and much larger than your typical Class C motorhome. We completely gutted this one and had custom cabinetry installed, including my office space. It works really well. I’ve been doing this long enough to know what suits my work habits best, so there’s no wasted space in this design. There’s also a pullout table top near the loveseat, so we can use that as a dining area too. 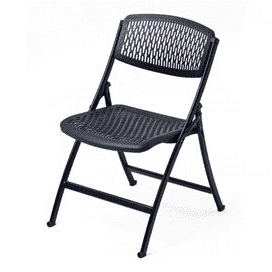 To do that, I turn my office chair around, and we carry one very comfortable, light weight folding chair. It’s nice looking and does the job! It slides into the back of our wardrobe closet easily when not in use. So how did we get this done? We went to Indiana and lived in the driveway of our Amish cabinet maker while he did the work. It was COLD! But worth it. And here’s how it looked when it was finished! Gene Miller is our cabinet maker extradordinaire! 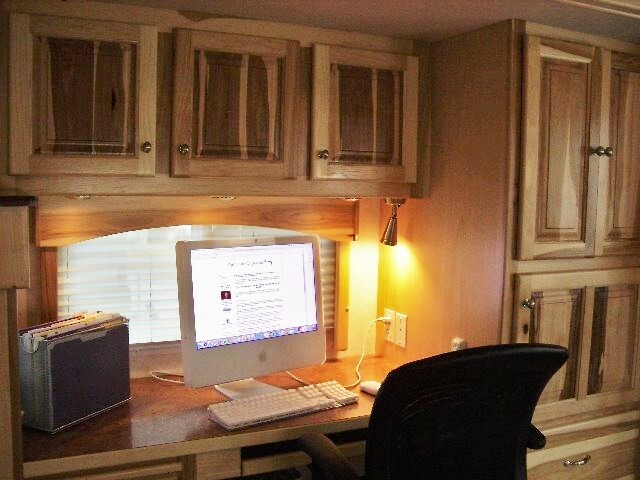 If you go to his website, and scroll down the page, you will see ALL the photos of my custom built RV office. 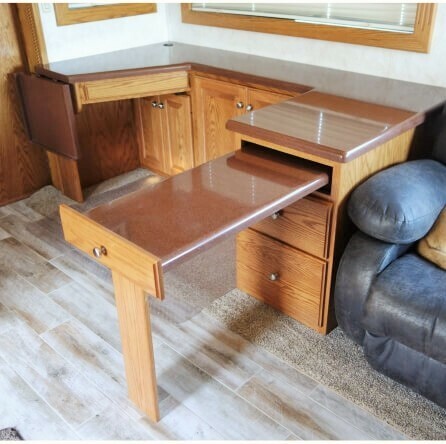 I highly recommend Gene for any woodworking project you might have in your RV. Now wait. 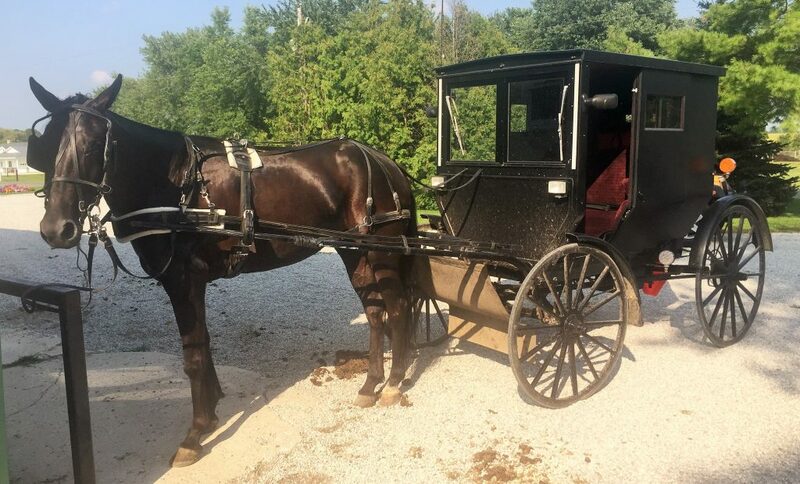 You may be wondering, why does an Amish cabinetmaker have a website? With photos? Online? Well…That’s a whole other story for another day! You’re an RV entrepreneur. You’re a digital nomad. You’re a road warrior! 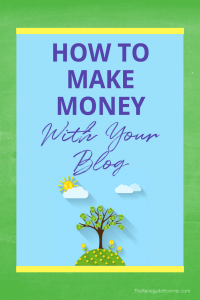 And that means you’re definitely going to need reliable Internet connections if you want to run an online business from the comfort of your RV. But you’re also going to need to be creative and flexible about that scenario at times. Our first line of defense is using a wireless router, also called MiFi by some cell phone providers. MiFi is a small device that operates off of your cellphone signal and is also your wireless router. When you need to use it, you turn on the connection and sit it on your desk. Then you can join your wireless network from any of your devices such as cellphone, tablet, laptop, or desktop computer. It automatically provides a secure network, but depending on where you are, you may find other networks showing up with a similar name as the one your device comes with. So, you will want to create a new unique name for your network. We use AT&T as our cellphone provider with Apple iPhones. We use two separate MiFi devices, which we purchased through AT&T. Our newest one is called a Nighthawk. They come with varying gigabyte plans, which will determine how much bandwidth you have available. Each of our units is on its own “unlimited” plan. But that doesn’t really mean unlimited, as in using it 24-hours a day, seven days a week. After you use 20 gigabytes in a month, you can be throttled if you are in a high-traffic area. 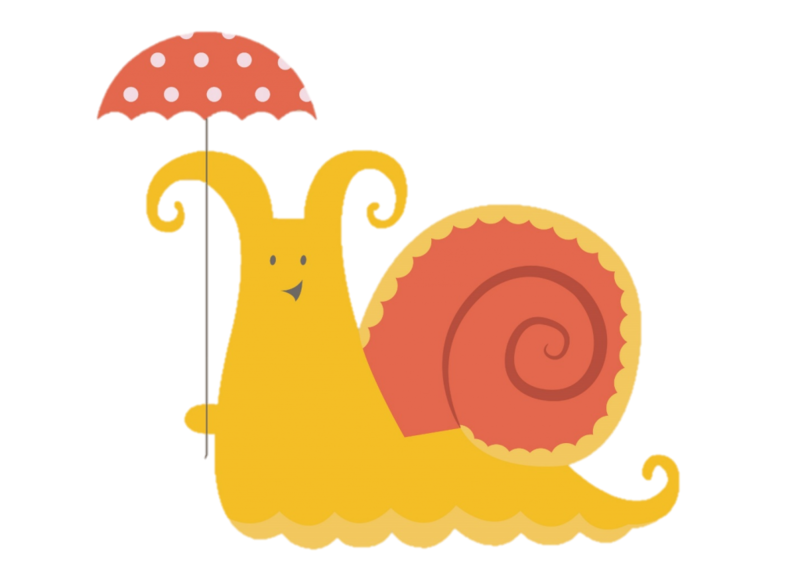 That means your online speeds will be reduced to a snail’s crawl. That’s why we have TWO units, each with unlimited plans, so we always have a backup if we get throttled. Streaming videos or music, Zoom calls, uploading and downloading high resolution photos…all of these activities will gobble up your data plan very quickly! You can also tether your iPhone to your computer and use it to provide Internet connection. We currently live in the best of times for working on the road in your RV, because there are many ways to connect to the Internet. If you’re staying in an RV Park, most have Wi-Fi available, but you can’t always count on the quality of it. So, I don’t recommend using that as your primary way to have Internet on the road. 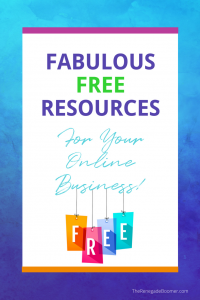 You probably already know most McDonald’s and Starbucks have Internet available, for the stereotypical “laptop lifestyle”, but frankly, this has never been a resource for me. I need to work in a quiet space, and I also prefer working on my desktop iMac, so that just hasn’t been something I’ve utilized. You’ll also find most Flying J truck stops, and others like Pilot and Loves usually have Wi-Fi available too, so that can be an option for you. Many Rest Areas and Welcome Centers provide Wi-Fi, which can be a great way to work for a while, while you’re taking an extended break, or even spending the night in a rest area in States that allow you to do so. There are various ways to check service areas for your cellphone coverage. Your cellphone provider should have coverage maps on their websites, so you can get a rough idea of where you’ll find adequate signal for Internet access. There are also various signal boosters you can get to increase the strength of your cellular signal, as well as regular Wi-Fi boosters. If you’re planning to spend a lot of time in the outback, far off the beaten track with no cellphone signal, satellite Internet is still an option, though it is very expensive. The systems can run as much as $6,000 to $15,000. There’s such a range of these, I’m not going to attempt to rate or recommend any. Most all of these options can be researched with a simple Google search. Now maybe you’ve got some Wonder Woman DNA running through your veins and can do both. But not me! Since I do ALL the driving of our 45’ mobile office, I need to keep my work days separate from my driving days. This is especially true when I’m on a “Truck Drivin’ Mama” push to get cross country, burning through 2600 miles in five or six days. That takes a lot of energy and concentration, which means I have very little left to devote to writing copy or taking care of other typical work day tasks. If you are doing both the driving AND the work, I recommend you plan ahead for long driving days. 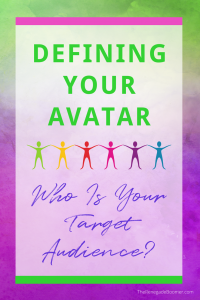 Factor them into your schedule when you are establishing work flow, deadlines, and consultations. At times, I can manage both a phone consultation and a driving day, but I have to plan for it. Since I can’t drive during a call and need to be parked, I can’t conduct business while the wheels are rolling. So, we’ll look for a Rest Area, Welcome Center, or plan to leave later in the day, or stop for the day sooner than usual. It’s all extremely workable IF you plan for it. This also means, not answering your business phone while you are driving or in travel mode. For one thing, it’s distracting. For another, you don’t want to be taken by surprise on a business call. I teach my students to guard their time and establish a perimeter of power around your availability as well. That means, SCHEDULING your calls. This also will teach your clients to value your time, rather than expect you to pick up the phone on a moment’s notice. The other way to handle long distances is simply to slow down. Admittedly, that’s a difficult one for me! I’m used to burning up the miles to get where we need to go, and then staying longer when we get there. By slowing down, you can plan a few days of driving, punctuated by several days, weeks, or months in one location where you can establish your work routine quickly, and consistently. 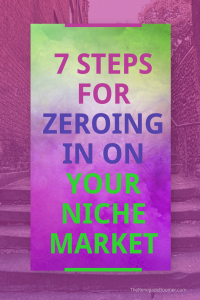 There are many pluses to this method, because then you can also structure your down times into the schedule. Besides, if you’re like me, you may need a day or two…or seven…to get your brain back into work mode instead of travel mode! Often times, my colleagues are surprised when they learn I get ready for work, even working at home online. Now don’t get me wrong…I’m all for yoga pants and bare feet as typical work attire! But not PJ’s. Not with “bed hair”. Not in “I’d be embarrassed to be seen in public” mode either. I do get dressed in some manner of presentable clothing. I fix my hair. I put on makeup. I put on my earrings. Why do I do this if nobody is going to see me that day? Well for one thing, because I see me! And because it sends a signal to my brain, body, and spirit that it’s time to go to work. There’s something about it that truly puts you into work mode faster than slouching around in whatever you slept in, with messy hair and unwashed face. Some of my colleagues have told me they started implementing this practice too and found it really does make a difference for them. It’s simple to do. It’s effective. I recommend you try it! I don’t know what it is about online entrepreneurs, but a lot of them are night owls. They like to work into the wee hours and seem to be very productive that way. Oh no way! 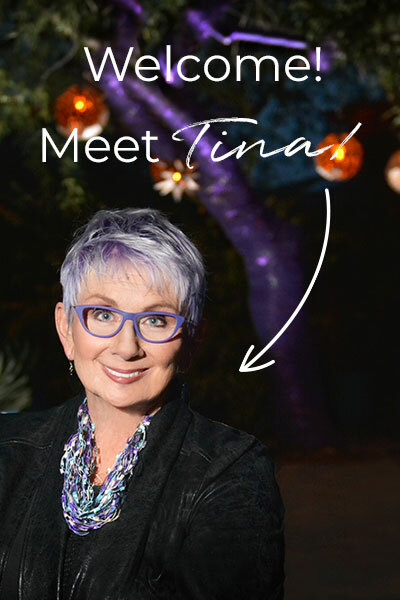 I’m the original early bird, often getting up at 4:30 a.m. to begin my day. 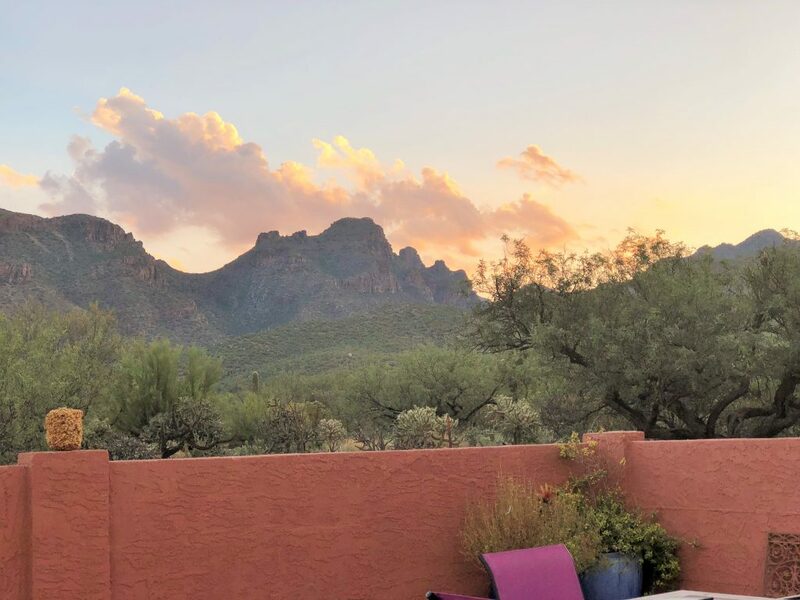 It’s not so hard when our summertime Arizona sunrises start early and look like this! If I could do EVERYTHING in the morning, I would. It pains me to have to shift some tasks to afternoon, or (shudder) evening hours! I’m simply way more productive in early morning, so that’s when I schedule my most important tasks of the day. 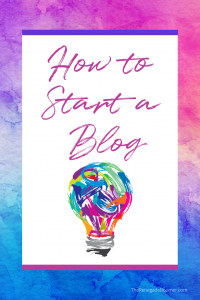 When I’m working on sales copy, it is almost always going to be in the morning. I will say though, I have trained myself to be able to be more productive in the afternoon hours. It might be that I’m proofreading some copy, taking care of phone calls, writing emails…that type of thing. And occasionally, I have been known to push hard for long hours, even into the night, when on a critical deadline. But this rare. The main thing is, whatever YOUR particular body clock timing is, honor it. You’ll be way more effective a lot happier for it. RV living isn’t always easy, but it’s almost ALWAYS worth it. There will definitely be challenges when you begin working from home online no matter where you are. But adding wheels and the open road to the mix can certainly create new challenges. Just remember, these challenges can usually be handled pretty easily. And the freedom you’ll experience as an RV entrepreneur, digital nomad, and adventurer is priceless. Eventually, you’ll have things so dialed in you hardly have to think about HOW you’ll manage it. You’ll be too busy enjoying WHERE you are, and WHAT you’re doing! 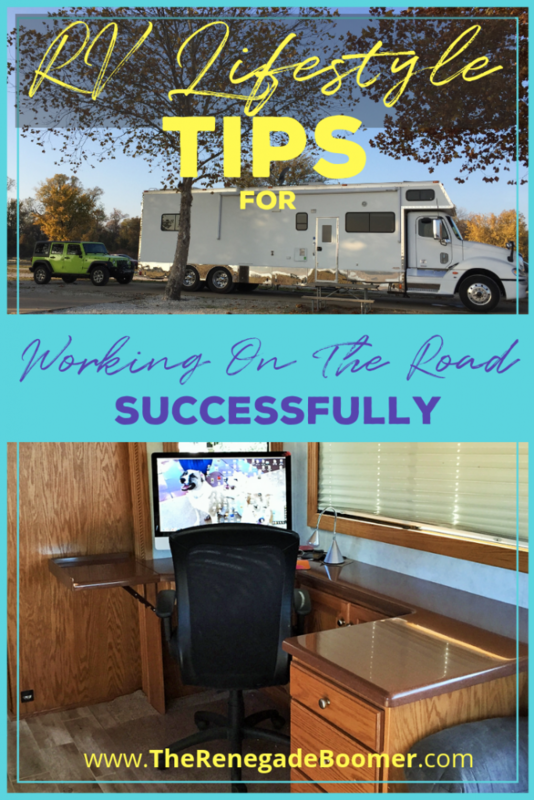 Do you have any tips for more efficient ways to work on the road from your RV?